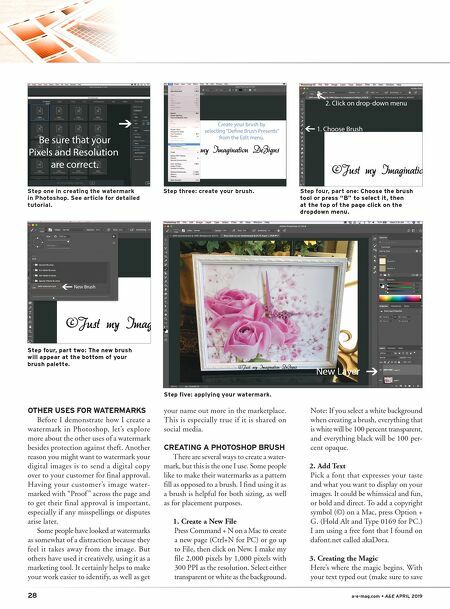 28 a-e-mag.com • A&E APRIL 2019 OTHER USES FOR WATERMARKS Before I demonstrate how I create a watermark in Photoshop, let's explore more about the other uses of a watermark besides protection against theft. Another reason you might want to watermark your digital images is to send a digital copy over to your customer for final approval. Having your customer's image water- marked with "Proof " across the page and to get their final approval is important, especially if any misspellings or disputes arise later. Some people have looked at watermarks as somewhat of a distraction because they feel it takes away from the image. But others have used it creatively, using it as a marketing tool. It certainly helps to make your work easier to identify, as well as get your name out more in the marketplace. This is especially true if it is shared on social media. CREATING A PHOTOSHOP BRUSH There are several ways to create a water- mark, but this is the one I use. Some people like to make their watermarks as a pattern fill as opposed to a brush. I find using it as a brush is helpful for both sizing, as well as for placement purposes. 1. Create a New File Press Command + N on a Mac to create a new page (Ctrl+N for PC) or go up to File, then click on New. I make my file 2,000 pixels by 1,000 pixels with 300 PPI as the resolution. Select either transparent or white as the background. Note: If you select a white background when creating a brush, everything that is white will be 100 percent transparent, and everything black will be 100 per- cent opaque. 2. Add Text Pick a font that expresses your taste and what you want to display on your images. It could be whimsical and fun, or bold and direct. To add a copyright symbol (©) on a Mac, press Option + G. (Hold Alt and Type 0169 for PC.) I am using a free font that I found on dafont.net called akaDora. 3. Creating the Magic Here's where the magic begins. With your text typed out (make sure to save Step three: create your brush. Step four, part one: Choose the brush tool or press "B" to select it, then at the top of the page click on the dropdown menu. Step four, part two: The new brush will appear at the bottom of your brush palette. Step five: applying your watermark. Step one in creating the watermark in Photoshop. 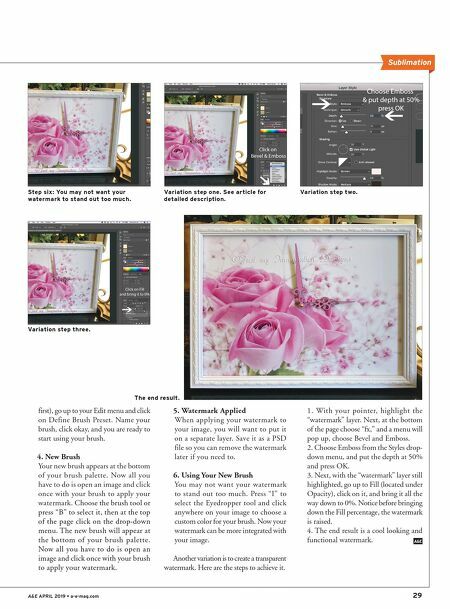 See article for detailed tutorial.